Have a Bigfoot problem on your back 40? Avoid lawsuits by posting several of these cool Rustic Tin Signs on trees, fences and gates. It lets visitors know that, while ‘Squatches may be furry and cute – in a hulking monster sort of way - , feeding them is serious, dangerous business. No Sasquatches? No problem! This charmingly aged and weathered sign looks awesome anywhere - garage, man cave, workshop, living room, bedroom, kitchen and more! At 12 1/2” x 16” it’s perfectly sized, so there’s really no wrong place to hang it! The amusing placard features a silhouette of Bigfoot shuffling between evergreen stands and the words “Warning! Please Do Not Feed The Sasquatch” in rugged, gracefully worn lettering across the top and bottom. The background mimics old weather-beaten wood planks, complete with rusted tacks, faded paint and visible woodgrain. Get two – one for yourself and one to gift. It’s a funny present no one will soon forget, and, thankfully, it’s easy to get as many as you want with our unbeatable prices! 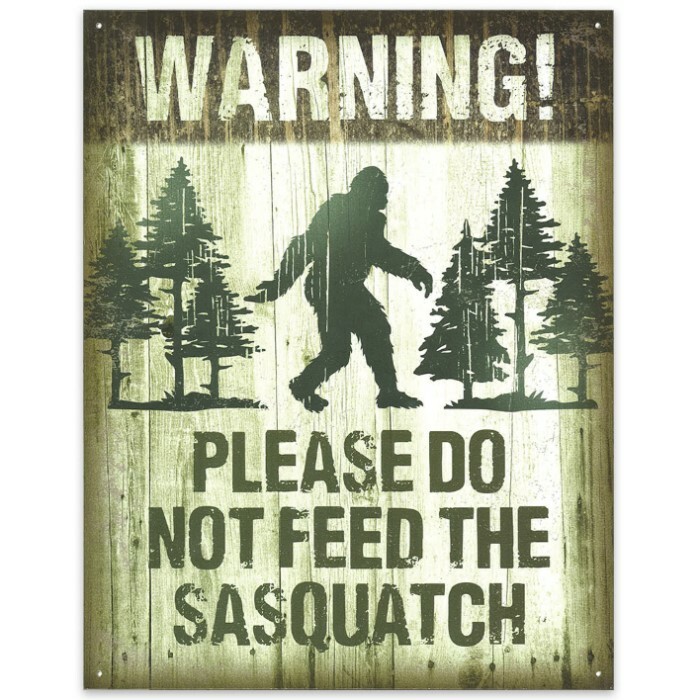 From small apartments to properties loaded with cryptozoological lifeforms and everywhere in between, no location is complete without a “Please Don’t Feed Sasquatch” Rustic Tin Sign.